The quality of your morning determines the rest of your day! Make sure it is as productive and focused as possible. 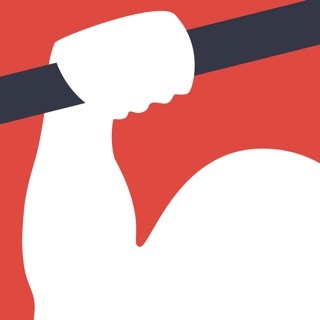 Featured on Product Hunt : "Great Product! 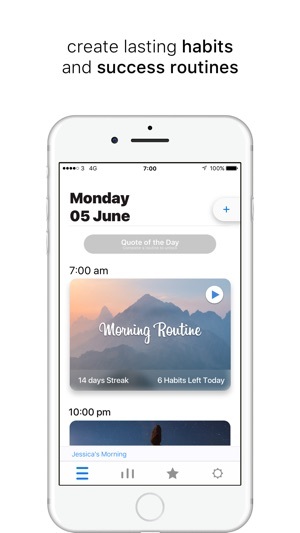 I find the mornings are a great time to make important decisions for the day"
The smart timer lets you know when to change from one activity to the other, even if your phone is locked, a notification will appear on your screen. The most successful people in the world follow a morning routine that helps them focus on key activities and progress in life, to get to the top! Check the stats for last week or last month using the stats. 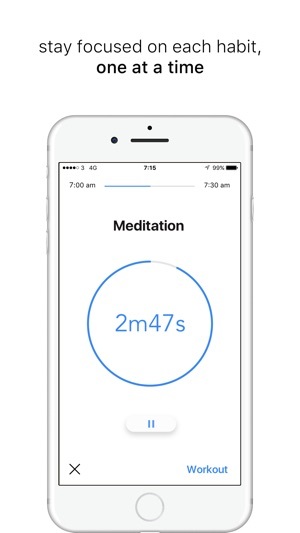 You realise you skipped meditation for a month : you know exactly what change you need to make! 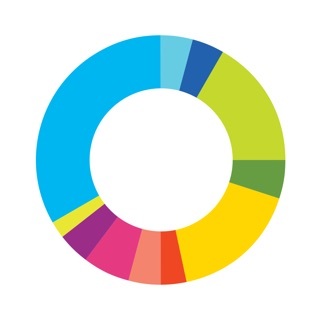 ● No usage of 3G data : this app doesn't need an internet connection. All data is saved on your phone and takes minimal space. We recommend having your phone on Airplane mode to avoid distractions during your routine. It is scientifically proven that completing small tasks gives great satisfaction and positive thinking, that leads to better and faster completion of the more important ones. This also largely increases productivity. "Great idea and design. I try to be more effective in the morning but my time managment isn't good. :)"
● "Super helpful. Love not having to think about order of my routine each day. Good work!" 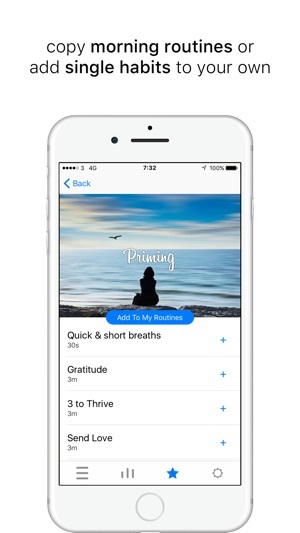 If you have read books like The Miracle Morning, The Slight Edge, The Compound Effect but struggled to implement the action steps, and want a tool to help you track your time and habits + create new ones, this app was made for you! 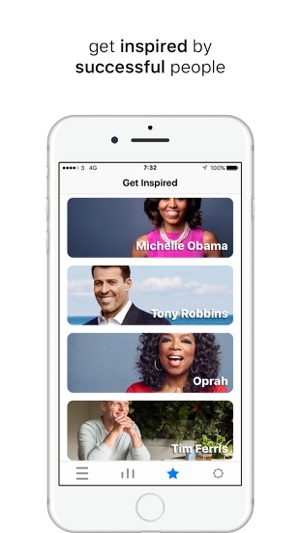 DOWNLOAD TODAY TO SEE GREAT IMPROVEMENTS IN YOUR LIFE! This update is all under the hood! Overall this app is great! I've created routines for my morning, when I first get into the office, when I get home from work, and before bed and they're really helping me stay organized and productive. * The Get Inspired tab isn't very useful after you've looked at it once but takes up 25% of the main navigation bar; a way to toggle it off would be nice. Similarly, the Daily Quote isn't something I use and the ability to disable it would be nice. * Give more options around moving from current task to next task. Currently, if I click next task it marks current task as not done. If I have 5 minutes allocated for "Do the Dishes" and finish the task in 3 minutes, let me mark the task as done and move on to the next one. Maybe have 2 options at the bottom "Mark as done" and "Skip"? * Pause behavior seems weird? Like it keeps moving through tasks in the background while paused? Again, if I have a 5 minutes "Dishes" task but it actually takes 8 minutes, let me pause it before the 5 minutes is up, unpause it when I actually finish the task, and have the routine pick back up without "stealing" the extra 3 minutes from the next task. Again, great app overall but I'd like to see more features around managing and interacting with routines and tasks, less inspirational/motivational stuff, and the UI either more minimal or more customizable. I love this app so far! I had similar complaints as someone else who reviewed this app. I was irritated that the tasks were automatically switching to the next one because sometimes I didn’t finish in the time I set it for; however I learned you can change this in the settings. Another thing I was irritated by was that if you selected the next task because you finished one early, it would mark it as complete. For a while I thought you had to let the time run out before it would cross out the task and mark it complete, but I learned you can swipe left and mark it as done. 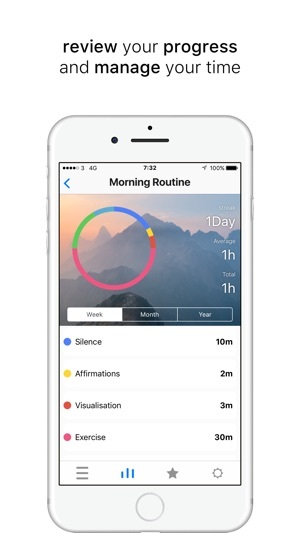 I’m big on routines and this app has me motivated to wake up in the morning when my alarm goes off! I love all of the task options that are available as well as the option to customize your own tasks. Five stars! Almost Perfect App! Love this app mostly, has really helped keep me on track in the morning and getting ready for work. I have morning routines for workout days and rest days, and a routine for Sunday to get ready for the work week! One thing I wish, is I made a “quick morning routine” that I plan to use if I ever stay up too late and need to get more sleep than my normal morning routines. I wish I didn’t have to assign it a day of the week because I don’t usually have to use it. I save it for emergencies like if I had a late night or I oversleep or something and can’t do my normal morning routine. I want to have it saved so I have it planned already if that were to happen, but I don’t want to assign it to a particular day of the week because they come up last minute.